Brandi Anderson is an 8th grade student at Warner Christian Academy in South Daytona Beach, Florida, and was the winner of the AMVETS Post 911’s “What Freedom Means to Me” Essay Contest. 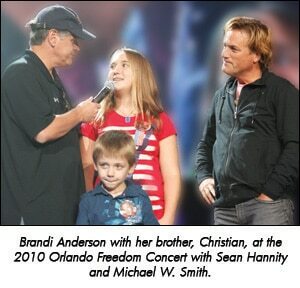 Brandi and her family were guests of Freedom Alliance at the Hannity Freedom Concert in Orlando, Florida, in August 2010. Brandi’s father, Navy Petty Officer 2nd Class Mike Anderson, was killed by enemy fire while serving in Iraq in 2004. Her father was the inspiration behind the essay, and with Brandi’s permission, we would like to share it with you below. Free-dom (free-dem) n. 1. The state or quality of being free; a) exemption or liberation from the control of some other person or arbitrary power; liberty; independence b) being able to act, move, use etc. without hindrance or restraint, confinement or repression. Freedom. What a beautiful word. A gift endowed upon us. Our birthright as an American citizen. Freedom has a very special meaning to me. I know what the price of freedom is. It does not come without a very high cost. Every man, woman, and child who lies their head down each night in peace, does so because some other American, at some time, layed down their life for them. I know this because I lost my dad in Iraq on May 2nd, 2004. He was a Navy Seabee sent there to help rebuild a country. He was killed, along with six of his fellow comrades when their camp was mortared. I will never forget the day that the Naval Chief and Chaplain showed up at my front door. I was only seven at the time but the words about to be uttered would change my life forever. The chief saluted my mom and myself, “The United States of America regrets to inform you…” My mom started to cry. I knew something very bad had happened. I was right. So much tyranny has been fought against through the years. From our WWI warriors to the young soldiers of WWII, sent overseas to save us from an inconceivable evil. They are truly ‘The Greatest Generation.’ Sadly we watch as so many of them depart us each day. Years later the Vietnam generation heeded their nation’s command. On September 11th, 2001 our beloved nation was attacked. Today we continue to fight for our most sacred possession. The right to live as a free people. With freedom comes responsibility. Envied by many, challenged by some. We must never become complacent. We have a duty to preserve our way of life. It is how we repay our debt to our fathers and forefathers. It is ironic how people perceive freedom. So many take this precious gift for granted. Yet there are many others who are deeply grateful. In the last six years I have had the opportunity to meet some really special people. Some have been celebrities or military figures. But a lot have been regular folk who just ‘get it.’ I’ve met a lot of other kids like myself and their families. It grieves me when I go to events such as TAPS, Arlington, dedications and memorials. There are a lot of people who have lost someone who can never be replaced. Because of my dad’s death, I have traveled to places and met people, I very well may never have. But I would trade all of that in a moment to get my dad back. Because none of that can fill the gap left in my heart when he died. My dad and I had many great memories that never will be forgotten. Although I get really sad sometimes, I am so thankful to have known my dad. Some children were born afterward and never got that chance. So when I see the flag waving or hear the Star-Spangled Banner or pledge my allegiance to the flag, I feel a real sense of pride. I truly hope our nation never forgets because I know I never will – FREEDOM IS NOT FREE!